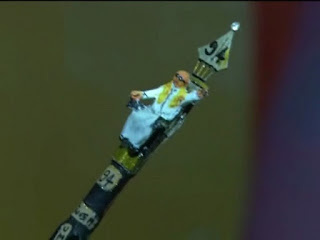 Coimbatore : Coimbatore's miniature artist Raja has designed a miniature golden nib with a diamond tip in order to honour Dravida Munnetra Kazhagam (DMK) leader Karunanidhi on his 94th birthday which will be celebrated on June 3. The nib is constituent of 800 milligrams of gold and four percent of diamond which is used up in the formation of the tip of the nib. The idea behind the creation of such a nib is to honour the literature work of Karunanidhi. diamond tip which I will be handing over to him one on one, in person on his birthday which will be celebrated on June 3."